51. Pre-Concentration – Savior or Not? - KJ Kuchling Consulting Ltd.
Can pre-concentration become a savior for the mining industry by lowering metal production costs? Pre-concentration is a way of reducing the quantity of ore requiring higher cost downstream processing, i.e. grinding in particular. One can attain significant cost savings in energy consumption and operating expenses by using a low cost method to pre-concentrate minerals into a smaller volume. A previous blog “Remote Sensing of Ore Grades” discussed one new pre-concentration method currently under development. Pre-concentration has been around for many years. However the techniques available are generally limited. Hence many ore types are not amenable to it..unfortunately. Ore sorting, which can be done using automated optical, electrical, or magnetic susceptibility sensors to separate ore particles from waste. The different sensors can rely on colour recognition, near infrared radiation, x-ray fluorescence, x-ray transmission, radiometric, or electromagnetic properties. The sensors can determine if a particle contains valuable mineral or waste, thereby sending a signal to activate air jets to deflect material into ore and waste bins. Density separation, or specific gravity differences are another property that some pre-concentration methods can use. Gravity based systems such as dense media separation (DMS), jigs, or centrifugal concentrators are currently in commercial production. Scrubbing, another very simple pre-concentration method is scrubbing, whereby simply separating fines or coatings may remove deleterious materials prior to final processing. 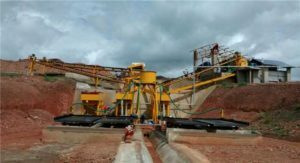 If done underground or at satellite mine site, the ore hoisting or ore transport costs can be reduced. If the pre-concentration rejects can be used as mine backfill, this can reduce backfilling costs. Processing of higher grade pre-concentrated mill feed can reduce energy costs and ultimately reduce the cash cost of metal produced. Grinding costs can be reduced if waste particles are harder than the ore particles and they can be scalped. Minimizing waste through the process plant will reduce the quantity of fine tailings that must be disposed of. Lowering operating costs may potentially allow lowering of the cutoff grade and increasing mineral reserves. Higher head grades would increase metal production without needing an increase in plant throughput. Not all ore types are amenable to pre-concentration and therefore a rigorous testing program is required. In most cases a pre-con method is relatively obvious to metallurgical engineers but testing is still required to measure performance. Testing is required to determine the waste rejection achieved without incurring significant ore loss. Generally one can produce a higher quality product if one is willing to reject more ore with the waste. It becomes a trade-off of metal recovery versus processing cost savings. Fine particles generated in the crushing stage might need to bypass the pre-con circuit. If this bypassed material is sent to downstream processing circuits, one may need to examine crushers that minimize fines to avoid excessive material bypassing the pre-con circuit. Reject waste or reject ore? One must decide if the pre-con system should reject waste particles from the material stream or reject ore particles from the stream. The overall metal recovery and product quality may be impacted depending on which approach is used. The bottom line is that the mining industry is continually looking for ways to improve costs and pre-concentration may be a great way to do this. Every process plant design should take a look at it to see if is feasible for their ore type. While the existing pre-concentration methods have their limitations, future technologies may bring in more ways to pre-concentrate. This is probably an area where research dollars would be well spent. Posted in: Mine Economics, Mine Studies, Tech. Tagged: Environmental, Feasibility Study, Tailings. I’ve always been attracted to the concept because of the huge energy savings that could come from waste rejection. The only method I’ve seen in operation is heavy media separation. In the recent past the push has been to target costs savings towards the mining side; use big equipment, use block caving, use bulk mining in order to lower mining costs. Accept the dilution and let the mill deal with it afterwards. However these days with scarcity of water, energy, and tailings disposal space maybe bulk mining isn’t the best idea anymore unless you can pre-concentrate. If you can’t pre-con, then selective mining may be the optimal path forward in the future given the growing constraints.